eBeam sale | eBeam Rocks! Hurry! Time is Running Out on Awesome eBeam Deal! from an authorized eBeam Reseller, comes with an eBeam Wireless Keyboard ($99 value)! Locate an authorized US Reseller or Canadian Reseller. We are Interior Dimension, Inc. in Ballwin, Missouri. You can visit our website www.ebeamrocks.com or call us at #314-629-3000. Contact a reseller and, when placing your order for eBeam Edge products, indicate you would like to take advantage of the eBeam Wireless Keyboard Back to School Offer. Include the following code in your order – RFWK. Choosing the Right eBeam System for You! Depending on your needs, your budget, and your existing equipment, there’s an eBeam system that’s a perfect fit for you! Please take a look at our website at http://www.shop.ebeamrocks.com/ and find your new eBeam system! Please browse through our store and shop with confidence. Our site is secure and any information shared with our website will never be used for ANY reason other than to complete your order. We invite you to create an account with us if you like, or shop as a guest. Either way, your shopping cart will be active until you leave the store. A few notes – Many of the products offer two different ways to connect – via USB or via Bluetooth. On our site, the products are listed separately (for example, we offer 2 options regarding the eBeam Edge Complete. One product will be listed as “eBeam Edge Complete – Bluetooth”, and another product listed as “eBeam Edge Complete – USB”.) Please call or email us with any questions regarding what solution will work best for you. ALSO – we offer discounts for bulk orders (more than 5 units) and often have promotions running for schools. We also offer discounts for buyers who would like to see our free demo, which we offer over the internet or in person. If you think any of these scenarios might apply to you, please contact me via my blog, or call us at 314-629-3000. If you purchase by June 8th and mention this blog, you can get a 10% discount on any of our products!!! So, don’t delay, contact us today! We pride ourselves on our great customer service and are always happy to assist anyone in any way, so please don’t hesitate to contact us for any reason! We believe in eBeam and enjoy sharing our eBeam knowledge with anyone who is willing to listen! Our Biggest eBeam Sale Ever… Continues! So, my boss must be feeling extra nice because of the holidays, because he’s extended our major eBeam sale prices until 12/31/11! Please check them out at http://www.ebeamrocks.com/eBeam_Sale_Pricing.html. You’ll be glad you did! 1. It’s Portable– It can turn any standard whiteboard, or other flat surface, into an interactive space. 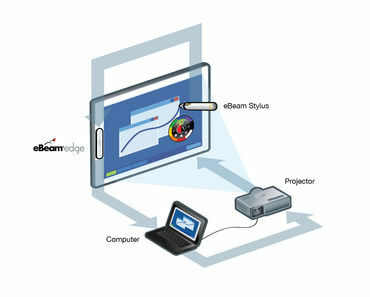 Only the eBeam Edge, a projector, computer, and a USB cable are needed (Bluetooth enabled versions are also available) to use it absolutely anywhere. 2. It’s Small– The eBeam Edge measures less than 8 inches long, and weighs less than 4 ounces. The stylus is smaller than a regular whiteboard marker. It can easily fit into purses and laptop bags, or even in a pocket, if you’re on the run. 3. It’s Easy to Install– Installation and calibration take only a few minutes and no special tools are needed. 4. It’s Easy to Use– The stylus, when used with the cute but effective palette icon, allows the user to manipulate the device with simple taps of the stylus. With the palette, the user can control the stylus as the mouse, as well as highlight, draw, and annotate on the capture area. It is user-friendly for all ages, and also for all levels of technological savvy. 5. It Promotes Sharing– The presentations created with the eBeam Edge can be shared directly with a classroom of students or a conference room of employees, and can be shared in real time on local networks or over the Internet. Then, all of the presented information can be saved for future use, or emailed to the participants for review. 6. Its WOW Factor– I use this in my home office, and every time I show it to a guest in my home, it blows them away. Professionally, eBeam Rocks! has done demonstrations to many different people– ranging from kindergarten teachers, principals, and department heads to CEOs, IT Directors, and national sales trainers– and we always get the same response- “Wow!” It really is a cool product with a ton of great features that help in teaching, training, brainstorming, planning, and more! 7. Its Low Price Tag– This is a great value! It gives you the functionality of a smart board at a fraction of the cost. “Interactive” or “smart” boards can cost up to $10,000 and of course, need to be mounted in a permanent location. eBeam Edge Projection is under $750* and can be moved quickly and easily to suit your needs. *Note- ebeamrocks.com is actually selling the unit for $553.00 right now as part of our holiday sale. eBeam Engage- An Amazing Classroom Tool! This is a short, informative video showing the multiple uses of eBeam Engage, and its benefits for the classroom. eBeam Engage creates a fun and interactive way for teachers to make their lessons rock! Take a look, and be very intrigued! Then remember to come and check out our great sale prices… http://www.ebeamrocks.com/eBeam_Sale_Pricing.html. The sale ends 12/16, so hurry, hurry, hurry!